1 División de Anestesiología, Facultad de Medicina, Pontificia Universidad Católica de Chile. 2 Facultad de Medicina Clínica Alemana, Universidad del Desarrollo. Despite the wide use of propofol target-controlled infusion (TCI) in elderly patients, pharmacokinetic (PK) and pharmacodynamic (PD) models performance has not been prospectively assessed in this population. The aims of this study are to derive four PKPD models using previously publi-shed PK parameters sets, and to prospectively assess their performance in elderly people. Step 1. After BIS® and routine monitors were placed, 41 healthy patients were anesthetized with plasma TCI of propofol (12 ug/ml). During induction and recovery, the relationship of BIS to predicted concentrations was analyzed using Marsh, White, Schuttler, and Schnider models. The plasma effect-site elimination rate constant (ke0), and an EMAX model were used to link PK model predictions with BIS response data, using NONMEM. Step 2. The 4 PKPD models derived in step 1 were tested in 12 healthy elderly patients receiving propofol-remifentanil anesthesia. Arterial blood samples for propofol assays were collected at 1, 2, 3, 5, 10, 20, 40 and 60 min post-induction, and at 0, 1, 3, 5, and 10 min after stopping the infusion. Median performance errors (MDPE), and median absolute performance errors (MDAPE) were calculated to measure bias and accuracy of each model. Multiple comparisons between models were performed with nonparametric multiple Behrens-Fisher-Test. Step1. Forty one ASA I-II adult patients (49.3 yr, range 22-94) were studied. The predicted concentration/effect relationships were adequately described in these patients with the 4 PK models tested and the new estimated PD parameters. A significant improvement (p < 0.05) was obtained in the fit of the BIS response data when age was introduced as a covariate for ke0 and Ce50 (concentration of propofol eliciting half of maximum effect). Step 2 Twelve ASA I-II elderly patients (77.6 yr, range 69-100) were studied. The PK performance of the 4 models tested was relatively poor in elderly patients (MDAPE > 30%). Marsh PK model (not age adjusted) showed the worst PK performance (MDPE = 60.4%, MDPE = 62.4%; p < 0.05). 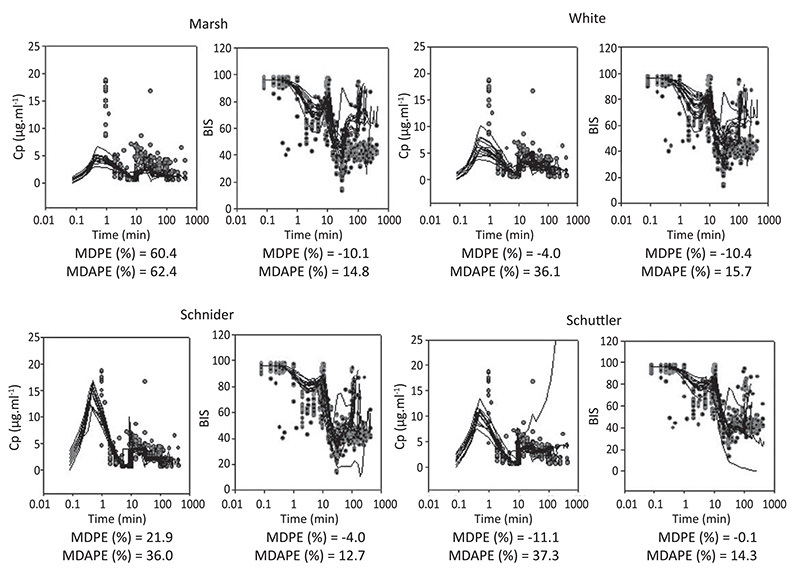 The time profile of propofol BIS effect in elderly patient was relatively well described (MDPE between 0 and -10% and MDAPE < 20%) with the four new PKPD models derived. Figure 1 shows diagnostic plots. (Black lines are models predictions. Red circles are measured observations). Although the global performance of the four currently available propofol PK models showed to be poor in elderly patients, the incorporation of the new derived age-adjusted PD parameters counter-balanced the observed PK errors and allowed a relatively good characterization of propofol effect in this population. Future refining of currently available propofol PK models is needed to improve their performance in elderly people.